Obama's Charter Policy Built on "Sketchy Evidence"
Could it be more than coincidence that while Bill the Oligarch huddled with corporate charterites that a national study would be released showing the bankruptcy of the charter solution? 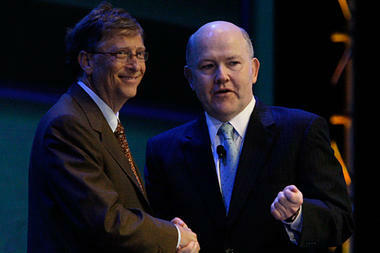 The Christian Science Monitor's caption for the AP photo: "Bill Gates shakes hands with Nelson Smith, President and CEO of National Alliance for Public Charter Schools, at National Charter Schools Conference in Chicago Tuesday, the same day that a government study found that charter schools do no better than public schools in student outcomes."
. . . But others believe that, while there still may be a place for some charters, research like this study doesn’t justify the massive public-policy push to create more charters quickly. The "gold standard" for research that the corporate charter reformers like to point to involves comparisons of lottery winners and losers in charters that are over-subscribed, i.e., more student apply than are accepted. These are the high flyers of the corporate charters, and the new study by the Feds compared lottery winners with lottery losers who attend public schools. These new finding have just quashed any remaining delusion that these test prep chain gangs can serve as replacements for public education, for either high performers or low performers. It should be noted that the research team include some rabid supporters of charters, including Paul Hill. 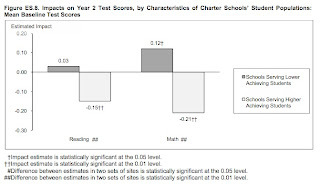 The one positive note for Team Charter in terms of test score comparisons comes with math score comparisons for charters with lower achieving students, while reading scores were a wash. 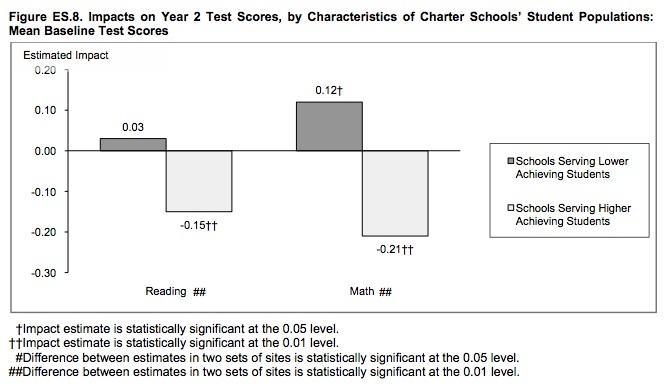 In charters with higher achieving students, the results are demonstrably awful in both reading and math (click chart above to enlarge). • On average, charter middle schools that hold lotteries are neither more nor less successful than traditional public schools in improving student achievement, behavior, and school progress. Participating schools had no significant impacts on math or reading test scores either a year or two years after students applied, other measures of academic progress (such as attendance or grade promotion), or student conduct within or outside of school. Being admitted to a study charter school did significantly and consistently improve both students’ and parents’ satisfaction with school. • The impact of charter middle schools on student achievement varies significantly across schools. Across 28 sites (covering 32 schools), the effects on reading scores after two years were estimated to be greater than zero in 11 sites and less zero in 17 sites (with magnitudes ranging from -0.43 to +0.33 standard deviation units), with 4 of the individual site estimates statistically significant. The estimated effects on math scores were greater than zero in 10 sites and less than zero in 18 of the 28 sites (-0.78 to +0.65 standard deviation units), with 10 of the site estimates statistically significant. impacts for study charter schools serving fewer advantaged students. operated by a private organization. Summer school or an increased investment in public libraries? Sent to the Washington Post, June 28, 2010. Jay Mathews notes that that academic achievement declines for low-income students over the summer and concludes that "Summer school is a great tool, if only more students would use it" (June 28). The decline in reading achievement over the summer, however, is actually an argument for increased funding for public libraries, not summer school. Some of the research reports on the summer slump, including Barbara Heyns' original study of summer learning published in 1975 and Jimmy Kim's more recent research, strongly suggest that scores go down during the summer because low-income children have less access to public libraries and other sources of books and don't do as much pleasure reading. The implication: More funding for public libraries in low-income areas, and a more cautious approach to increasing time dedicated to traditional instruction. Too much traditional instruction could limit time for wide, self-selected voluntary reading, the single most important factor in improving reading achievement. Kim, Jimmy. 2003. “Summer reading and the ethnic achievement gap,” Journal of Education for Students Placed at Risk 9, no. 2:169-188. PPS central services and operations — including administration, finance and payroll, transportation, building maintenance and more — will cut spending on materials and services, as well as reduce staff by the equivalent of 25 full-time positions (or FTE). Reductions to these services, staffed centrally but touching all schools and programs, include elimination of the equivalent of 52 full-time teaching positions through shifts in staffing assignments and a delay of program enhancements. This cut will eliminate the equivalent of 126 teaching positions in PPS schools — further reducing already lean school staffing. To ensure all students have access to the same core educational program, PPS will provide specific direction on what schools should cut. For grades K-8, the district will take a uniform cut to a common program so that all schools face the same challenges. For example, all schools would cut PE or enrichments and library staffing to maintain greater equity and more consistent programs across schools. The loss of PE instruction by specialists could be mitigated by having classroom teachers lead students in physical activity, or through other strategies. The approach will not be decided and acted upon until the school board provides clear direction. High school staffing also will suffer substantial cuts and significant increases in class sizes, particularly in core classes. Cuts to the English as a Second Language department are particularly concerning given the district's long history of inadequate service for these students. It will also be interesting to see if schools in wealthier communities raise funds to mitigate these cuts. PPS - like many other districts - allows parents to privately fundraise for their child's school, and it doesn't take a genius to see how this allows more affluent schools to beef up programming while low-income schools are stuck with the bare bones "core" program. 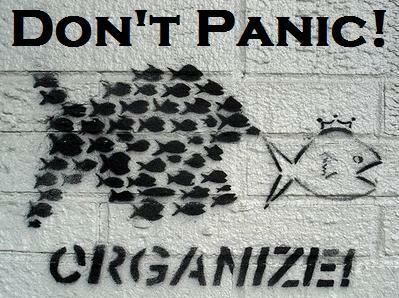 Rotten to the Common Core: When Will Parents and Teachers Revolt? Below is a letter from Georgia teacher, Cindy Lutenbacher, reprinted from the Atlanta Journal-Constitution. 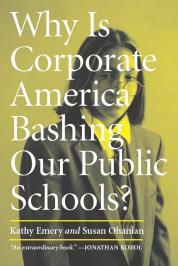 The Business Roundtable's national standards movement is on Go, and coming along with it is the national testing movement, as announced last week, with two groups of corporate interests vying for control by leading two groups of governors by the nose to the $160 million that will pay the corporations to develop the national tests from which they will then profit mightily: "Two big coalitions of states are competing for federal dollars to create a series of new national academic tests to replace the current patchwork system." So, I have a few questions for those who back the standards — including our own governor, Sonny Perdue, who co-chaired the Governors Association effort. In the general celebration over the release of these new standards, it seems very few people are asking what Common Core Standards will actually mean for our children. And that is a mistake because the Common Core Standards are simply the forerunner to even more (and likely worse) standardized testing. Why are so few investigating the origin of Common Core, which is largely a creation of Achieve Inc., an outfit that is driven by a dozen or so governors and CEOs of major U.S. corporations? What do these people know about educating our children? Why would we trust them? Why do we simply accept the claims of “research- and evidence-based” support for the creation of Common Core Standards? Why are we not doing as we were admonished to do during Watergate … that is, to follow the money? Where is this independent research, unattached to corporate monies? In creating these standards, Achieve, the governors and the school officials ignored the vast body of truly independent research that shows such “standards” and their inextricably linked standardized testing are worse than folly and are sending our children in the exact opposite direction of what they need. This group of very rich people ignored this body of research that shows that the single most powerful factor in education gaps is poverty and not standardized testing. Did they forget that the United States has the second highest rate of children in poverty of any industrialized country in the world? In fact, these purveyors of Common Core disregarded everything that at least every great teacher I have ever known believes, says and lives in his/her classroom. What we should be doing in Georgia and the rest of the country is focusing on filling our classrooms with great teachers, rather than with thousands of new standards. We should be supporting our great teachers, rather than driving them from our schools, as will certainly be the outcome of an even greater emphasis on testing. Why does anyone cite the “A Nation at Risk” report in pushing for national standards even though it’s been so thoroughly discredited? Where is the hue and cry over the million dollars that the Gates Foundation gave to the National PTA in order to promote Common Core? Who appointed Bill Gates Emperor of Education? Is money being spent, to borrow a Bushism, to “catapult the propaganda”? Or is that last question simply rhetorical? The architects of these Common Core Standards did not seem to consider all the research that amply demonstrates that having access to a variety of reading materials and having the time and safe space with which to read are the factors that help children become readers. Instead, the standards rely on the absurd drilling tactics advocated by the politicians and corporations happily taking our tax dollars for their testing and related materials. Who is really getting the money from turning our schools into Common Core drill-and-kill testing factories? Will Perdue be willing to read the list of literary texts listed in the 183-page Appendix for English Language Arts and allow me to test him on them? Will Perdue even take the 12th-grade exit exams and allow his scores to be made public? Can Perdue explain to me how “Tartuffe,” Euclid’s “Elements,” Paine’s concept of “ground-rent,” and a bivariate polynomial have helped him in governing our state? And in related news, we learn that Perdue has vetoed the excellent bill that would have saved millions of dollars for our state and, more importantly, released our first- and second-graders from the hideous spectacle of useless standardized testing. Will he be willing to sit in a desk with 30 other governors, who, like hapless 6-year-olds, will be forbidden to speak to one another and must suffer silently as they are endlessly drilled in preparation for the CRCT? Furthermore, when will Georgia get a state schools superintendent who actually understands children and how they learn, rather than, for example, one who understands politicians and chambers of commerce? Will the new superintendent be willing to sit obediently through first-grade test prep for Common Core Standards? Is there anyone, anyone, who actually believes that Common Core Standards and its murderous standardized testing will not lead to even more fanatical requirements that cause teachers to have to teach to the test? There’s no evidence that these “standards” will help my children be lifelong learners. When will we as a state and we as a nation wake up to the destruction of our children that is being carried out under the sanctimonious and specious names of accountability and reform? And most important of all, for the sake of our kids, when will we revolt? "If any school district in this state is sitting on perfectly useful school buildings that it isn't using and doesn't have any prospect of needing, people say, 'Well, they should have to sell them. They refuse to sell them; they should have to sell them'," Daniels said. "Sell them? Hell, they should give them away. The public already paid for them once." Daniels cited the Gary Community School Corp. as an example in his remarks. When he visited KIPP LEAD Charter School in April, Daniels noticed the Gary charter school had to move a meeting to a nearby bakery because the school didn't have a room large enough to accommodate the group. The 100 million dollar PR machine behind KIPP could almost make you forget that KIPPsters attend schools that are black enough to get a George Wallace seal of approval. I came across the work of Scott Page again this evening, and when I checked, I had somehow forgotten to post this interview article in the NYTimes back in 2008. As the lunatic segregationists take center stage in politics, it is good to note that there is good science behind the argument for diversity. But then, when did science matter to the Gang of Five in Wake County? . . .the black-white test score gap in math is typically estimated as approximately onestandard deviation at fourth grade and eighth grade (Bloom et al. 2008). Half of these KIPP schools are producing impacts large enough to cut that gap in half within three years (p. xv). So what does this study tell us that we did not already know, since KIPP’s high test scores have been acknowledged even by its harshest critics? We find out that KIPP schools have higher levels of grade repetition, i.e., failures, than the public schools. In the 22 fifth grade cohorts, for instance, the average failure rated was 9.5 percent, ranging from as low as 2% and as high as 18%. In public schools, repeaters in 5th grade ranged from 0% to 3%, with an average of 1.7 percent. In 6th grade KIPPs, these numbers were slightly lower but still much higher than their public counterparts. We find out that KIPPs are more segregated than demographically matched public schools, ranging from 5 to 50 percent more segregated. Twenty of 22 of the KIPPs were significantly more segregated (pp. 2-3). We find out that 12 of 22 schools had lower significantly lower percentages of special education students, with only one significantly higher.
. . . Students who transfer within-district tend to have lower baseline test scores than students who do not transfer at all. For KIPP, the baseline scores of students transferring in-district were significantly lower at 12 schools (in at least one subject); none of the KIPP schools recorded higher baseline scores for students transferring in-district. The pattern at non-KIPP schools was even more pronounced: compared to those who do not transfer, students transferring in-district had baseline scores that were significantly lower in at least one subject in all 22 sites (p. 16). What we don’t know, however, is if the 12 KIPP schools with significantly lower baseline scores mentioned in the above quote are some or all of the “approximately half of KIPP schools [that] attract students with significantly lower baseline test scores than the districtwide average” (p. 14). In other words, is KIPP attrition higher in the KIPP schools that have significantly higher numbers of lower performers in its general population? Put another way, are the higher attrition rates in some KIPPs the same KIPPs that have higher percentages of lower-achieving baseline students? This we do not know, for the researchers are mute on this question. What we do know from this study is that KIPP is not alone in dumping its low performers. All of the 22 public schools used in the comparisons, in fact, are playing an unending game of swapouts, where low-performing students that might threaten the schools’ AYP scores are moved from school to school in a never-ending shell game of the left behind. The KIPP study's description of attrition only considers half the equation, when comparing KIPP schools to matched traditional public schools. The researchers looked at the attrition rates, which they found to be similar - in the sense of the number of students departing from schools. But they never considered the receiving or intake rate. Even though the researchers agree that the students who are mobile are lower performing, they do not take into account the reality that KIPP schools do not generally receive these students. Professor Miron conducted his own quick analysis, using the Common Core database, and concluded that there is a 19% drop in enrollment in KIPP schools between grades 6 and 7 and a 24% drop in enrollment between grades 7 and 8. (This analysis only included KIPP schools that had enrollments in all three grades). In comparison, traditional public schools in these grades maintain the same enrollment from year to year. This one factor must represent an important difference when comparing KIPPs’ performance and the publics, but how much we don’t know. Again, the researchers are mute on this one, too. One other potential problem that pops out in this study is the participation rate among parents for the various schools. The average consent rate for all schools participating was 71 percent, but in some schools it was as low as 37 percent. Did these schools solicit participation from all parents, or were some more encouraged to participate than others? With the stringent contractual obligations that parents sign off on, and with the total compliance that KIPP demands of students and parents, it is, indeed, odd that consent rates vary so widely (p. 40). Again, the researchers do not speak to these variations. So KIPP schools have high test scores, and there is no one in the media who seems to care about anything else that happens, or doesn’t happen, at the KIPPs. Meanwhile, the corporate reformers are pouring in hundreds of millions to perfect a total compliance model that the general public will buy for urban America. And it does not matter if disenfranchised children are having their childhoods stolen away and their minds altered for the benefit of demonstrating that poor children can be manhandled into responding on a test like middle class children. KIPP students are regularly subjected to a regimen of “positive psychology” that combines alternating treatments of learned optimism and learned helplessness in order to instill a sense of individual responsibility and unerring behavioral control. Trillions for Wall Street. Main Street? Not so much. Hundreds of thousands of unemployed workers have already lost their unemployment insurance benefits as a result of Congress’ failure to approve a measure that would maintain extended benefits to the long-term unemployed. EPI is tracking the number of affected workers and will provide regular updates. Missing from "Libraries fading as school budget crisis deepens," June 24, is the overwhelming and consistent evidence showing that school library quality and the presence of a credentialed librarian relate to reading achievement as well as to other measures of school success. This has been demonstrated at the state, national and international levels. Also missing is the fact that while library funding is being cut, we are planning to spend billions on new standards and national tests, which will result in far more testing than we have ever done before and far more than we need. We are apparently much more interested in measuring than in solving problems. The group of reading specialists invited to present at the US Dept of Education's special meetings on reading (see http://susanohanian.org/outrage_fetch.php?id=698) look pretty much like the same gang that brought us Reading First, a program that failed every empirical test. The feds are really slow learners. What's next for this administration? Bernie Madoff as secretary of the treasury? Sarah Palin as ambassador to Russia? Rush Limbaugh as chair of the Democratic Party? RALEIGH In an attempt to draw parallels with civil rights leader Martin Luther King Jr., a pair of local activists issued a letter today explaining why they were willing to be arrested to oppose the end of Wake County’s school diversity policy. In the letter, the Rev. William Barber, head of the state NAACP, and the Rev. Nancy Petty, pastor of Pullen Memorial Baptist Church, write that their actions were decided to force the community to confront the issues now facing the school system. They were among four people arrested for disrupting last week’s school board meeting. Their letter is a direct play on Rev. King’s famous “Letter from Birmingham Jail,” which he wrote in 1963 after being arrested for protesting municipal segregation in Birmingham. Ala. King argued in the letter that direct action through non-violent demonstrations were needed to combat segregation. “In the best American traditions, from Henry David Thoreau to Ella Baker to Martin Luther King, Jr., we recognize the necessary place of civil disobedience: breaking a small and unjust law in order to protect a larger and broadly significant law,” Barber and Petty write. Supporters of Wake’s diversity policy have repeatedly tried to link their fight with that of the civil rights movement of the 1950s and 1960s. They’ve argued that the school board majority’s elimination of the socioeconomic diversity policy will lead to racial resegregation of Wake’s schools. Opponents of the board majority have held mass protests, engaged in acts of civil disobedience and sung civil rights era songs at school board meetings and rallies. Tim Tyson, a Duke University historian and author who was among those arrested at last week’s board meeting, has repeatedly tried to tie the call for neighborhood schools with George Wallace, the segregationist governor of Alabama. Barber announced Monday a mass demonstration in Raleigh on July 20 to coincide with that day’s school board meeting. . . .
"Global Wave of Action for Education"
During one of the last international chat meetings [March 7th] of the „International Student Movement“, which was attended by activists in Sierra Leone, the U.S. of A., Italy, Germany, Austria, Spain, France, the Netherlands, the Philippines and Kosovo, we decided to call for a „Global Wave of Action for Education“. The participants suggest that this „wave“ kicks off with co-ordinated protests in some regions of the world - such as occupations in schools across Italy, which are expected to begin in the middle of October. 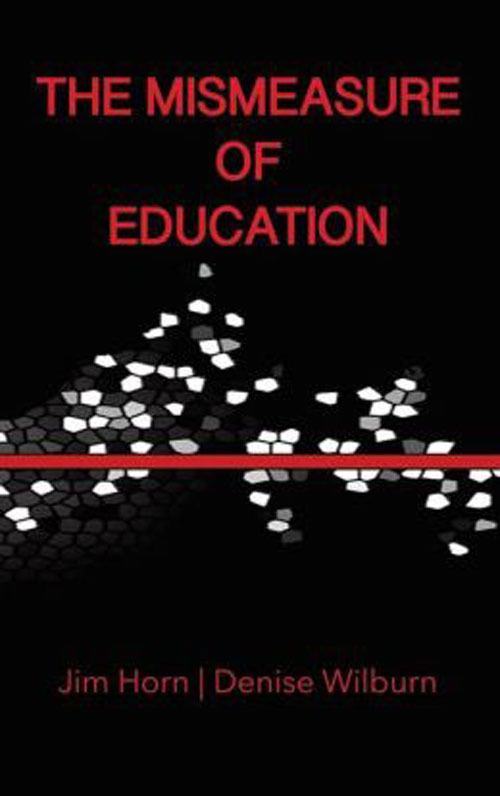 October 7th will also see a huge day of action in the U.S.A..
Q) You know the history of education policy -- and the effects -- as well or better than anyone. What are the biggest mistakes the Obama administration is making right now? A) The biggest mistake they have made is that they bought into the consensus around high-stakes testing, this NCLB belief that someone must be punished if scores don’t rise every year, especially "bad" teachers. They adopted Republican ideas about accountability and choice, and they have used Race to the Top to promote more privately managed schools and more high-stakes testing. Living outside the Beltway, I am struck by the fact that the education think tanks in DC are like an echo chamber. Almost all share the "consensus," and because they agree with one another, they think they are right. The Obama administration bought into that consensus, and seems utterly tone-deaf to how their agenda is received outside the Beltway. Teachers -- not just union leaders -- are unhappy, frustrated, and demoralized. So are parents, because they don’t like the high-stakes testing regime either. They don’t like that their children are losing time for the arts, science, history, geography, physical education, foreign languages, and everything that is not tested. They may not be well-informed, yet they know that their children are missing out on a good education. Q) Have you met with any Obama administration officials? Members of Congress? What do you say? What did they say? A) I was recently invited to meet with high-level administration officials in the White House. I told them my concerns. I told them what I have heard from teachers and parents. They told me I was misinformed. I think they should listen more to the grassroots, not just to the think tanks and the media. Over the past few weeks, I have met with many Democratic members of Congress. I have met some really impressive members who understand how destructive the current "reform" movement is. Many agree with me that the emphasis on evaluating teachers will simply produce more teaching to the test, more narrowing the curriculum, more gaming the system. They have heard from their constituents, and they don’t like what is going on. But frankly, these same Congressmen and women tell me that they are probably helpless to stop the President’s agenda. The Democratic leadership will give the President and Secretary Duncan what they want, and they will have the support of Republicans. That leaves the Democrats in a quandary. They were not happy to see Secretary Duncan campaigning for his approach with Newt Gingrich. Maybe it will turn out to be a winning strategy for Secretary Duncan. He may get what he wants. It just won’t be good for American education or our kids. Q) When the administration officials told you you were mistaken, what did they say you were mistaken about? A) I asked why they are pushing states to increase the number of charter schools, when studies and NAEP show that charters don’t get better results on average than regular public schools; they said they are not pushing states to increase the number of charter schools. I was incredulous because many states lifted their charter caps in hopes of getting RTTT money. When I asked if they thought it was a good idea for state legislatures to set professional standards for evaluating teachers, they again disclaimed any connection with what states are doing to get RTTT money, even though the administration wrote the criteria and the states are responding to them. Q) If you got a chance to talk to President Obama, what would you tell him? A) I would urge him to change course before it is too late. I would tell him that charter schools in the aggregate don’t get better results than regular public schools. I would tell him that his push to have teachers evaluated by student test scores is wrong, and that standards for evaluation should be designed by professionals, not by politicians. I would urge him to stop using language of failing, punishing, closing, and firing and speak instead of improving, building, supporting, and encouraging. I would urge him to think about ways of strengthening American public education because it is one of the foundational elements of our democracy. I would urge him to speak about the importance of a strong curriculum for all kids in every school, one that includes the arts, history, literature, foreign languages, civics, economics, physical education, science, and mathematics. I would urge him to recognize that high-stakes testing in basic skills steals time from everything else that should be taught and that it is thus undermining education. I would also implore him not to recommend testing every other subject, as there would soon be no time for instruction, only testing. Q) Do you think there will be political consequences for the administration’s education policy? A) The administration’s alienation of teachers is a really bad idea politically. There are four million teachers, and they vote. They have families. There are retired teachers, who care deeply about our public education system. The President is heading into a tough mid-term election. I don’t see the point of cultivating Republicans and endorsing their agenda of privatization and tough accountability, because they won’t vote for him anyway. And I don’t see the point of disrespecting public school teachers, who are one of his core constituencies. Reading the description of the Reading for Understanding Research Initiative, it is clear that the US Department of Education has (finally) recognized the limits of research on decoding skills and is prepared to move on (see age 5). But they still don't get it. They now claim that decoding is necessary but is not sufficient for reading comprehension (and, I assume, that methods that focus exclusively on decoding are not the way to go), and will invest $100 million on research that will contribute to developing ways to "accelerate growth in oral language and word knowledge in ways that are likely to close reading comprehension gaps" (page 11). Unmentioned is the slightest hint that "decoding skills," word knowledge, oral language development, reading comprehension itself, and a host of other competencies (e.g. spelling, grammar, writing ability, knowledge of the world) might be the result of actual "Reading for Understanding," the result of children reading a wide range of interesting and comprehensible texts. 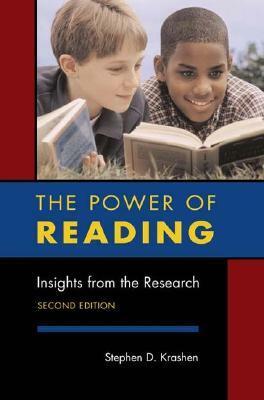 Unmentioned is any realization that our "literacy crisis" could have one fundamental cause: Children of poverty, the group with the low reading scores we are concerned about, suffer from a profound lack of access to reading material. That $100 million could be used to help solve the problem. It could go toward supporting libraries and librarians in high-poverty areas, and would represent more than five times the current annual federal government investment in school libraries in high-poverty areas. His Lardness, Gov. Chris Christie, appointed another ideologue like himself, Bret Schundler, to run what has been up until now one of the best state systems of public education in the country. Highly unionized and highly funded, New Jersey has made a reputation for itself, one that the corporationists want to demolish. Here, in short, is one roadmap for chartering's way forward: First, commit to drastically increasing the charter market share in a few select communities until it is the dominant system and the district is reduced to asecondary provider. The target should be 75 percent. Second, choose the target communities wisely. 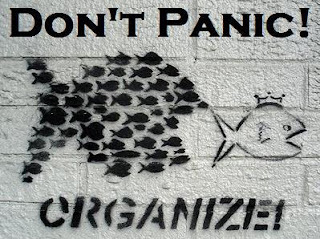 Each should begin with a solid charter base (at least 5 percent market share), a policy environment that will enable growth (fair funding, nondistrict authorizers, and no legislated caps), and a favorable political environment (friendly elected officials and editorial boards, a positive experience with charters to date, and unorganized opposition). For example, in New York a concerted effort could be made to site in Albany or Buffalo a large percentage of the 100 new charters allowed under the raised cap. Other potentially fertile districts includeDenver,Detroit,Kansas City, Milwaukee, Minneapolis,New Orleans, Oakland, and Washington, D.C.
Third, secure proven operators to open new schools. To the greatest extent possible, growth should be driven by replicating successful local charters and recruiting high-performing operators from other areas. Fourth, engage key allies like Teach For America, New Leaders for New Schools, and national and local foundations to ensure the effort has the human and financial capital needed. Last, commit to rigorously assessing charter performance in each community and working with authorizers to close the charters that fail to significantly improve student achievement. 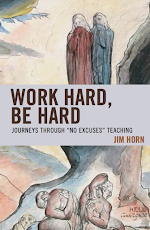 In total, these strategies should lead to rapid, high-quality charter growth and the development of a public school marketplace marked by parental choice, the regular startup of new schools, the improvement of middling schools, the replication of high-performing schools, and the shuttering of low-performing schools. As chartering increases its market share in a city, the district will come under growing financial pressure. The district, despite educating fewer and fewer students, will still require a large administrative staff to process payroll and benefits, administer federal programs, and oversee special education. With a lopsided adult-to-student ratio, the district's per-pupil costs will skyrocket. At some point along the district's path from monopoly provider to financially unsustainable marginal player, the city's investors and stakeholders--taxpayers, foundations, business leaders, elected officials, and editorial boards--are likely to demand fundamental change. That is, eventually the financial crisis will become a political crisis. If the district has progressive leadership, one of two best-case scenarios may result. The district could voluntarily begin the shift to an authorizer, developing a new relationship with its schools and reworking its administrative structure to meet the new conditions. Or, believing the organization is unable to make this change, the district could gradually transfer its schools to an established authorizer. Wednesday’s talk by the former Florida governor was organized by Baton Rouge Business Report Publisher Rolfe McCollister and sponsored by the Bentonville, Ark.-based Walton Family Foundation. After leaving office in 2007, Jeb Bush launched his own education organization in Florida, the Foundation for Excellence in Education, on which he serves as president and chairman. From that platform, Bush has continued to advocate across the country for the conservative “free market” education reforms he promoted in Florida. Bush said changes in public education undertaken by Florida since 1999 have been successful and should serve as a model for other states, including Louisiana, which he noted is on a similar track. He said strong reforms like Florida’s have five components: accountability with a “hard edge,” tougher and more-focused academic standards, increased school choice, more-effective teachers and greater use of instructional technology. During the question-and-answer session, Bush noted that Florida had to keep a tighter rein on quality as it expanded school choice and made sure charter and private schools were financially stable. He urged avoiding such pitfalls because early problems make it easier for critics. “They use the failure of one school to try to destroy school choice across the entire state,” Bush said. He did note that the “Berlin Wall is cracking,” crediting President Barack Obama for pushing states like Louisiana to start measuring teacher performance, over the resistance of teacher unions. Yes, Jeb, your endless faith in free-markets - especially when applied to social problems - is testament to your inability to imagine the common good. Maybe Jeb can join hand with Mayor Bloomberg (below) and encourage all students to pledge an unwavering faith to the free-market system that is incapable of tackling issues like global climate change, gross social inequity, and endless imperial wars. The h/t for this story goes to Douglas Crets, Tom Vander Ark's right hand man and EdReformer blogger. And - surprise, surprise - the EdReformer webpage was "incubated by New Schools venture Fund with support from a donor committed to innovations in learning." Yes, Mr. Bloomberg, our teachers should take to the streets to defend the casino capitalists and corrupt traders making billions off of things like credit default swaps, hedges, and other highly speculative derivatives. Keep in mind, Mr. Bloomberg, that these same hucksters pay very little in taxes despite the trillions of dollars trading hands, and they'll fight to the death to prevent any regulation, taxation, or transparency. Every American will need to get more than a high school diploma, and by 2020, America will once again have the highest proportion of college graduates in the world. So with money choked off from the community college expansion and with broke states starving out the public colleges and universities, where to turn to make the President's pledge come true? NEW YORK (Dow Jones)--For-profit college investors applauded the U.S. Department of Education's announcement Wednesday of a number of proposed reforms covering higher education, though analysts warn stocks could see pressure down the line as one issue remains unresolved. The government-proposed reforms cover 13 major shortcomings in higher education, but the department said it will hold its recommendations on the 14th--a measure that would penalize schools for graduating students with high debt loads--until later this summer. Investors were excited to see the government take a more studied approach after industry lobbyists warned the proposal could "crush" the for-profit school sector. Shares of DeVry Inc. (DV), a school some analysts say would be hit hard by the delayed proposal, were recently trading up 2% to $57.48, while Apollo Group Inc. (APOL) gained 2% to $49.27. American Public Education Inc. (APEI) was up 1.2% to $46.81 and Capella Education Co. (CPLA) climbed 1.2% to $86.62. The delayed proposal, intended to judge schools on how well they prepare students for gainful employment in a recognized occupation, was expected to force many programs to cut tuition or even shut down entirely. The Education Department has recommended that programs disclose job placement and graduation rates, as well as student debt loads, by June 2013, but said it will continue to study possible metrics by which to judge school success and will release another proposal on that subject later this summer. "Some key issues around gainful employment are complicated and we want to get it right so we will be coming back with that shortly," Education Secretary Arne Duncan said in a statement. . . . Doing that would require some complicated and uncomfortable math for the schools: calculating “debt-to-income loads,” which is the ratio between how much a graduate owes in student loans and how much he or she earns. If the salaries are insufficient to pay off the debts – a common complaint among graduates of for-profits – the institutions would lose federal education funding and likely close. With billions of dollars at stake, for-profit colleges lobbied heavily against a plan floated a few months ago by the Education Department to link gainful employment to an 8 percent debt-to-income load, which the industry said would put many programs out of business. The lobbying appears to have worked to shelve that proposal, at least for now: on Tuesday, the department announced new rules covering 13 of 14 areas of for-profit higher education reform, leaving the gainful employment proposal for “later in the summer.” . . . .
Arizona's Next Target: "Anchor Babies"
"We're at the mercy of the testing company." Is there a US science education crisis?